PEAKS label-free quantification successfully demonstrates its high-level of accuracy in this year’s ABRF iPRG study. The first graph shown is an overview of all the participating Study IDs in relation to their results as seen on slide 20 in the Preliminary Results Summary. 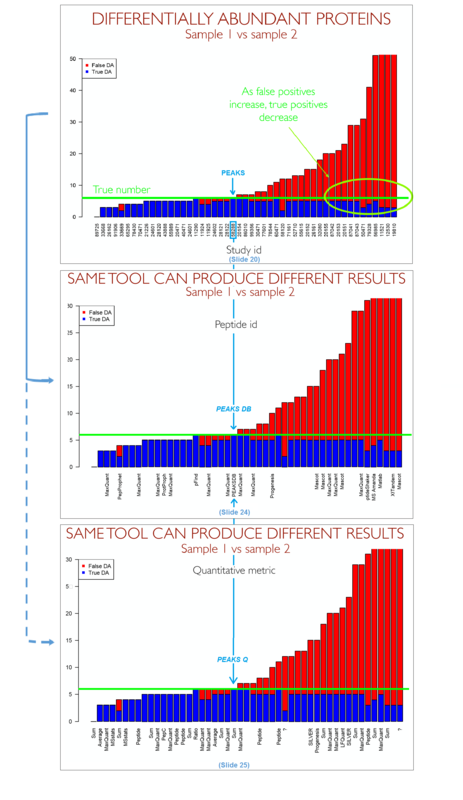 The same graph is then presented again on slides 24 and 25 (zoomed in), to show the specific tools used for peptide ID, as well as quantification for each submission. The purpose of the study was to evaluate different data analysis methods for relative protein-level quantification in label-free proteomics. To truly focus on the statistical assessment of the varying data processing approaches, the peptide identifications and their associated integrated peak intensities were provided.